For the full blog entry, visit Ted Lehmann's Blog. Most participants arriving at Jam Camp have little or no experience playing with others and are justifiably nervous and uncertain about the experience they have committed themselves to. Early on the first day of Jam Camp, Pete begins with helping them to get rid of some of their anxiety as well as becoming accustomed to playing together in a large group. This eases the tension and begins to build the sense of group cohesiveness, mutual support, and personal confidence that makes Jam Camp work so well. Within a couple of hours, participants have divided themselves based on an assessment of their own skill level and then been divided into preliminary jam groups. Each group contains a representative selection of instruments and can count on having a staff member spend time with it during each session to provide support and feedback. In the novice groups, a more experienced camper also aids in moving the group along. By lunch time on the first day, anxiety levels have begun to drop and campers are actually making music together. Even though the music is sometimes tentative and a little rough, the atmosphere of mutual support and encouragement allows each participant to feel successful and welcome. The jam groups practice the skills that have been discussed in the large group sessions, and gain experience singing and playing songs. Some of these come from a list of widely known songs Pete provides as well as from suggestions brought by campers. Pete varies the pace of activities and the intensity to keep sessions interesting and lively. Groups develop skills and support becomes increasingly strong, allowing campers to try out new skills in the safety of the group. Campers who had never sung in public or who were reluctant to play a solo on their instrument on Monday morning are singing solos and taking breaks by Wednesday. Here's the more-or-less straightforward account of what jam camp was about; there were deeper things going on as well, but I'll have to write about them separately. 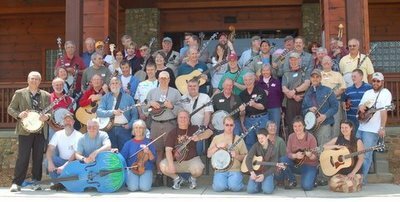 The idea behind the bluegrass jam camp is to gather musicians who, because of shyness or lack of opportunity, have had little or no experience playing with a group of people, i.e. jamming, and giving them a chance to do so in relaxed and unthreatening surroundings, as well as teaching some of the basics of jamming etiquette and technique. Camp was held at Wilkesboro Community College, home of MerleFest, for the four days prior to the festival. Just shy of forty people attended, Chris and me included. Maybe half of the folks had attended the camp previously, and were returning for the sheer fun of it.